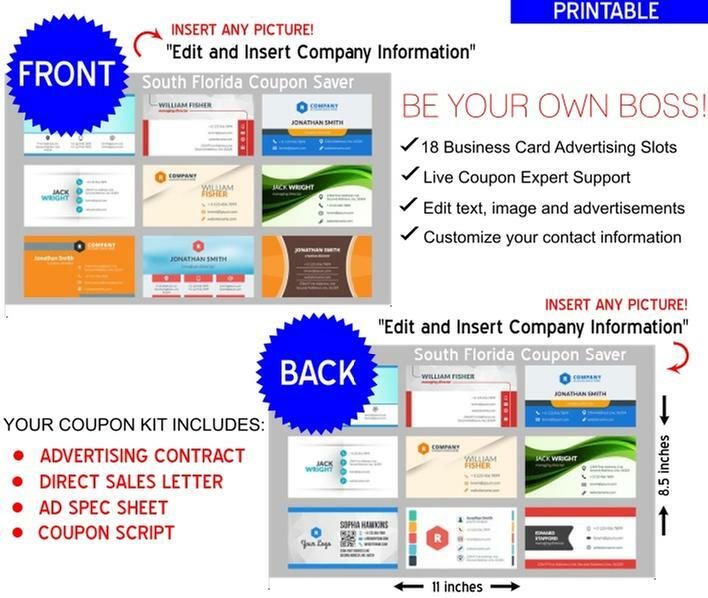 "START A COUPON BUSINESS PROGRAM KIT"
Start a Coupon Business™ (a division of Local Coupon Marketing™) is the premier service for the creation of custom coupon templates. Entrepreneurs can use our service to easily start their own local coupon book business. If you do not have a local coupon business in your area then this is truly a "golden opportunity" to develop a new, consistent revenue generating income stream for you and your family. Our eye-catching, full color and printable coupon template is sized at 11 x 8.5 (landscape orientation when printed). These templates are double-sided and have a total of 18 advertising slots. There are 9 ad spaces on one-side and 9 more ad spaces on the reverse side of the template. Each advertisement is editable and is a standard business card size measuring 3.5 x 2. START GENERATING PASSIVE INCOME TODAY! Each template can also be customized to include your region, company name, logo (or any image including your advertiser's business card), address, website, phone, email and fax. All coupon templates are instant downloads and are 100% editable so that you can easily insert your "sold" advertisement into (or up to) 18 revenue generating advertising spaces. We also provide you access to a live coupon expert if you should have any questions about the in's and outs of your "Start a Coupon Business Program Kit!" "Our double-sided coupon template are similar to those that you may have seen at the entrance at nearby grocery and retail stores, restaurants or perhaps you may have received one in the mail." What's included in your coupon business kit? Yes, I want to start my own printable coupon business!